There's a better way to use SSH tunnels than the standard port redirection we all know and love. In case you’ve never used them, SSH tunnels are freaking useful. They turn SSH servers into temporary proxies so you can connect to hosts you can’t reach directly. Keep reading. The traditional way to create tunnels is by using the -L option of ssh. Let’s say you want to manage your home’s AP. You usually do this by browsing to https://192.168.1.4. When it logs in, you’d browse to https://localhost:8080 and see your AP’s administration portal. Static assets will need to be redownloaded and cached again. If the website uses absolute URLs to load its resources, it won’t work. Each time the website redirects you to https://192.168.1.4/something, you’ll have to correct the URL manually. You’ll have to login again, because the session cookies for 192.168.1.4 will not be in effect. Any previously saved passwords won’t apply. URL autocomplete won’t be useful either. The AP will not receive Host: 192.168.1.4 as usual, but a confusing Host: localhost:8080, which can give problems with virtual hosts. Fortunately, there’s a way out of all this. Instead of using -L, use -D <port>. This instructs ssh to create a SOCKS proxy that’ll tunnel every incoming connection through your SSH session. And set your browser to use the SOCKS proxy at localhost port 49000. Then, just browse to https://192.168.1.4 as you’d do at home! Think about it. No more bashing against the wall until you realize you typed -L 8080:192.168.1.4:80 instead of -L 8080:192.168.1.4:443. No more seing ERR_CONNECTION_CLOSED until you type in the «https://» before «localhost». URL completion works. Redirects work. Absolute URLs work. You can browse just as if you were at home. It’s also more natural. 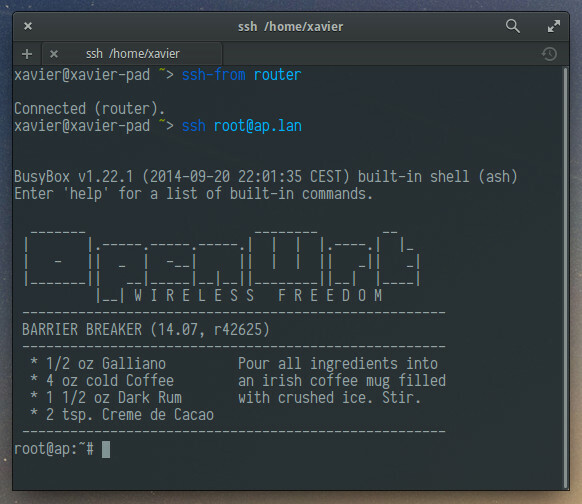 You can first ssh into the router, then think of what you want to access. If you then want to manage another device, no need to kill ssh and run it again changing the -L option. There’s one more perk: names are resolved from your router too, so if browsing to https://ap.lan would work from home, it’ll also work with the SOCKS proxy. Isn’t this the way you always wanted tunneling to work? We can see that using -D plays well with browsers. But not all tunnels are made to access web portals. Another frequent use for SSH tunnels is SSH itself (i.e. to SSH into an otherwise unreachable host). When you do ssh root@ap.lan, ssh won’t ask you «Are you sure you want to continue connecting (yes/no)?» since it knows it’s connecting to your AP. And options in your .ssh/config set for your AP will be honored. 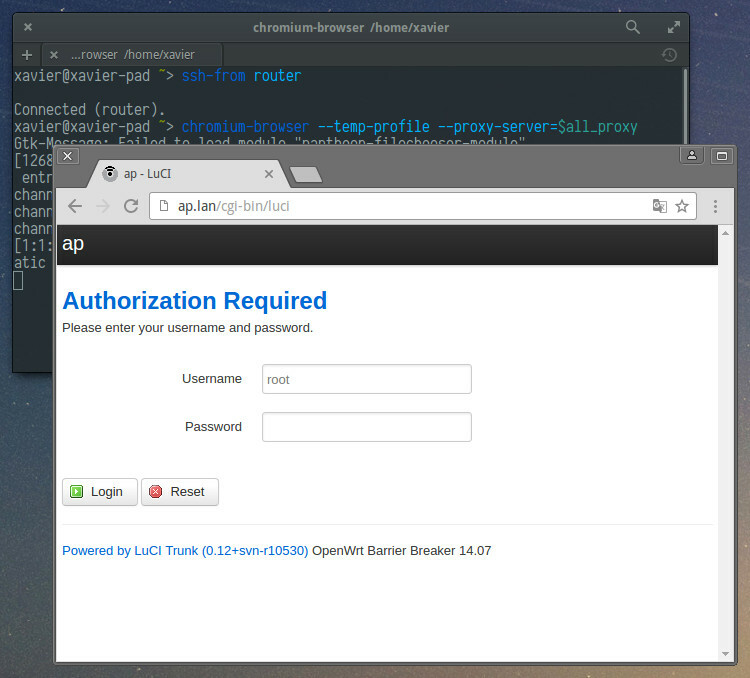 This is impossible with -L.
To make it even easier, I made a command called ssh-from. 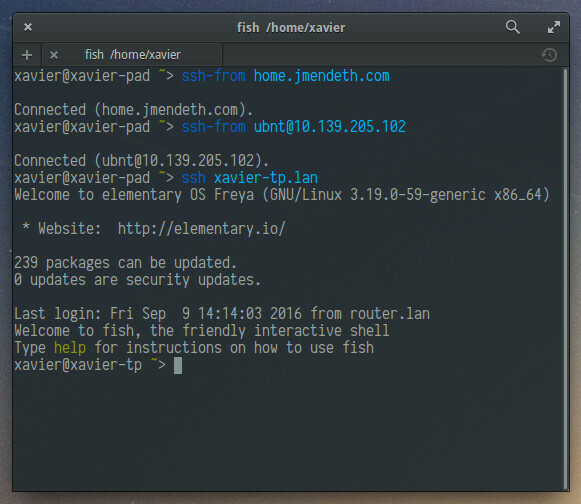 You invoke it just like ssh, but instead of getting a remote shell to issue commands in, you get a local shell “tunnelled” through that host. When you’re finished, type exit to terminate the proxy. Using ssh-from to SSH into the AP from outside. Using ssh-from to manage the AP through its website. Connecting to a laptop behind two routers, by nesting ssh-from sessions. 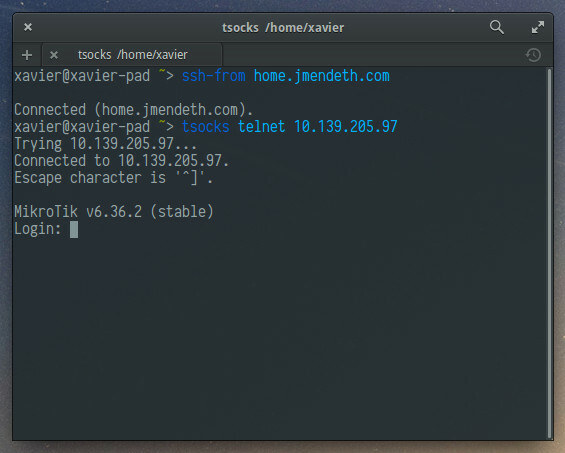 Connecting by telnet to a host through ssh-from. Was ssh-from useful to you? Any suggestions? Please let me know in the comments! This handy bot runs commands on demand and sends the live output, allowing you to interact at any time. It can even run graphical apps! ©2019, Alba Mendez. Some rights reserved.